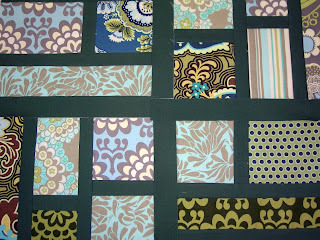 Here is a sneak peak of the quilt I am making. I put a dent in it today; but, still have a ways to go. Had to stop when the room got too hot. 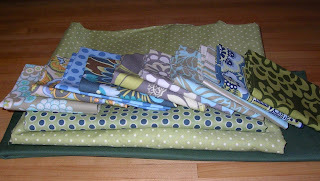 I am using 10 fat quarters and a solid green sashing. Usually, I am not fond of solid colors unless it is kona black. However, in this case, it is working for me. By the way, never turn you back on a 14 week-old puppy. I have decided that is probably about the terrible two's in human years. 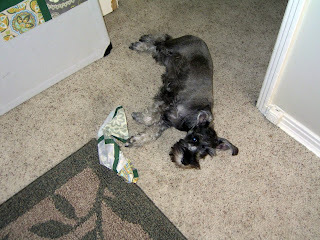 How can a small puppy reach up and pull a drying blouse off the door and break the hanger? Not to mention pulling blocks off the design wall. And, doesn't she look innocent? Oh, what are a few Trudy bite marks in a quilt? After all it is going to family. Besides, she is somewhat forgiven today because she let me sleep until 7:00 AM. And that is a good thing. This is my newest project. It's going to be a quilt. 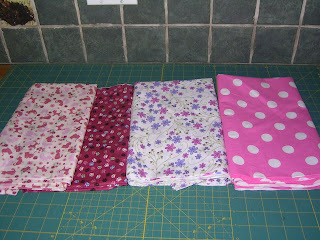 I'm still not sure which pattern I will use, or if I will even use all of these fabrics. Who knows, I might end up with couple more. I actually went back to the store and bought more of the bottom fabric, just in case. Good I went, I had to buy the rest of the bolt. Honestly, they didn't have that much. The fat quarters are Amy Butler. My daughter loves her fabrics. What do you think? I belong to a wonderful Yahoo Group called C-R-A-F-T. We have become a group of friends who happen to live, quite literally, all over the world. We have been through, birthdays, weddings, births, successes, sorrows,and funerals. And from time to time someone in the group just needs a hug. That is when a healing heart quilt is perfect. 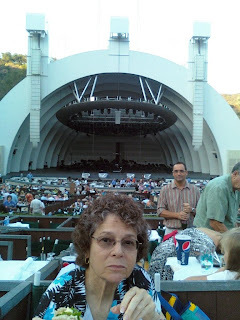 Recently one of our friends, Kath, has been going through a bit of a rough spell. She is on the mend right now; but, she needed some hugs. 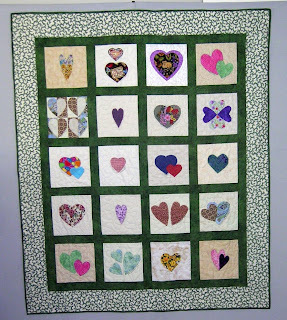 These hearts were collected and assembled into a quilt. Just look at all those hugs. Kath has it now and I understand she is wrapping herself with our great big group hug. We love you Kath. Remember that fabric for dresses I bought a while back? 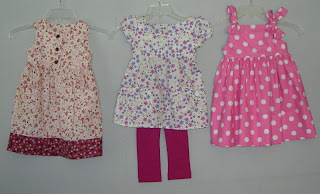 Here is the outcome: three little dresses. I thought I had broken my sewing machine for a bit. But, in the end it just needed a reset. I found that out by accident when I turned it back on after being off all night. They are finding their way to Florida at this very moment. I wonder if I'll get pictures of the dresses being modeled? I hope so. Robin recently created this pattern and I volunteered to be a pattern tester. This way I get a really cute bag right away. It is a fun pattern to make. I only used three fat quarters and still had some leftovers. 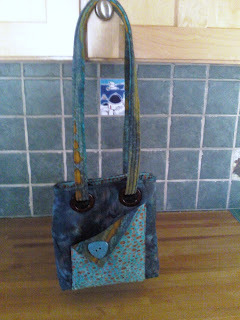 I am using this bag as a thank you gift. I guess I will need to work on another one right away. Stay tuned for the published pattern, which will be soon. 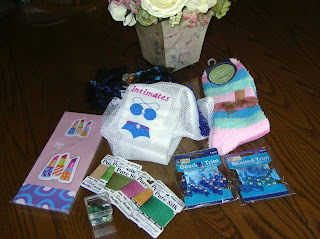 Naturally it will be found at our web site: http://www.twowackywomen.com/ Happy sewing. 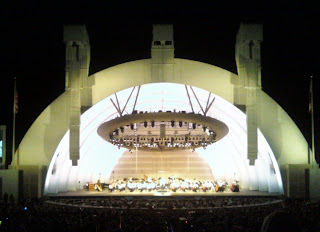 Last night I was lucky enough to be invited to the Hollywood Bowl to see John Williams. He is the composer who works side by side with Stephen Spielberg. 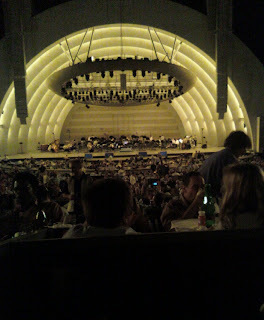 So it was Movie Night with John Williams and the Los Angeles Philharmonic Orchestra. Each one of us packed her own picnic and passed around chocolate and wine, a perfect pairing with perfect company and a perfect evening. I was talking to my two-year old granddaughter , Noelle, this week. She requested a pink and purple smooth dress. A smooth dress, by the way, has no ruffles. So, like a good grandma, I went fabric shopping (because I don't have any fabric in my stash). Guess what I will be doing this weekend?